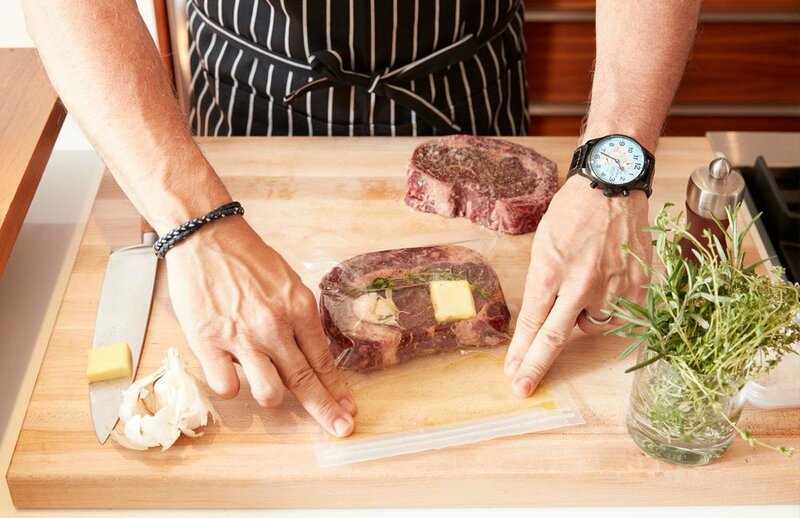 HEAVY DUTY CONSTRUCTION: The Zakarian Pro For Home Sous Vide Bags are the same grade and quality that Chef Zakarian uses in his professional restaurant kitchens. The heavy duty construction stand up to high heats and keeps your ingredients protected. Included in each box are plastic bag sealers to ensure the zippered top is firmly closed before placing the filled bag in the water bath. This eliminates any chance of water leaking in to your bags. FOOD SAFE: The bags have been tested and certified as FOOD SAFE. They are BPA-Free and made of FDA food-grade PA+PE material. With these bags, you can cook worry-free about the presence of any unsafe byproducts. Cooking Sous Vide without FDA approved food grade bags is not recommend. SIZE OPTIONS: There are two sizes available – Large (Gallon Capacity) and Small (Quart Capacity). With different bag options, you can cook multiple items or portions at one time in the water bath. Gallon size is great for preparing soups, stews, sauces, braises and large cuts of meats. The quart size is great for individually marinated chicken breasts or cuts of meat, small pieces of fish and moderately portioned vegetables. FREEZER SAFE: Bags can easily be labeled and placed in to the freezer for storage. This is especially great for Sauce or Soup Applications.